As your gin-writer in residence, I am always exploring all things juniper. This August, I found myself in New York City and there was one spirit that was on my mind: GIN. 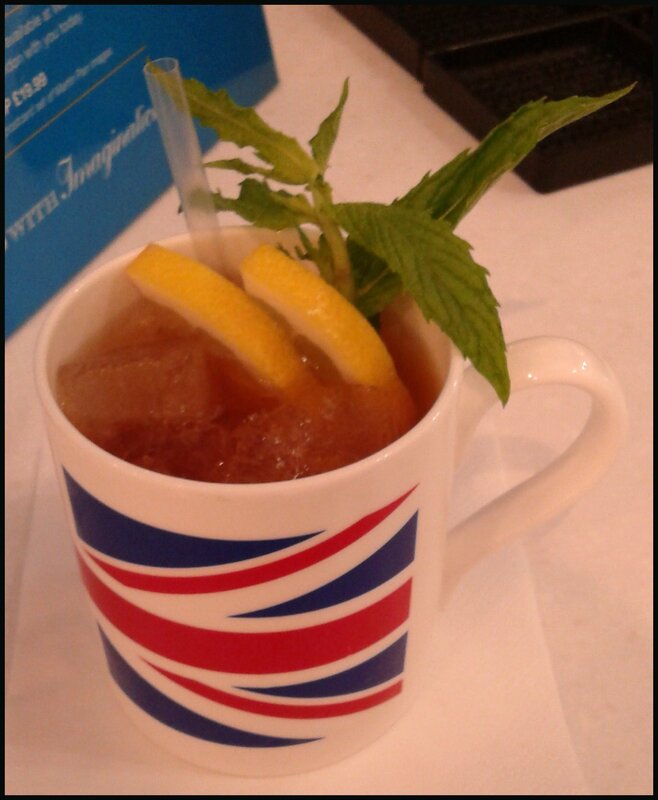 We started off early at Heathrow Terminal 5 with a mug of Bombay Sapphire’s Summer Cup. This comes at a time when this category is gathering more momentum and moving beyond Pimm’s with both Master of Malt and Chase launching new products in August. The Bombay Sapphire Summer Cup was a mix of Bombay Sapphire Gin, Red vermouth and Orange Liqueur, served with ginger ale from pitchers with a fruity garnish. Our second day saw a trip to the liquor store to pick up “essential supplies”; our shop of choice was Park Avenue Liquor at 292 Madison Avenue. I like to think of this as New York’s Gerry’s. The family who run it were both friendly and knowledgeable, and there is a great selection of gins, as well as Scotch and American whiskies, liqueurs and other spirits. I picked up some Comb 9 Gin from New York State, which has a honey spirit-base (essentially distilled mead). This gives the gin a smooth and silky texture, with a lot of floral notes upfront. The gin describes itself as a New York Dry Gin, which is essentially a contemporary version of the Classic London style. Comb 9 makes a crisp and floral Martini with a decent dose of coriander, which will appeal to fans of flowery gins such as Bloom or G Vine; it produces a pretty tasty Negroni, too. 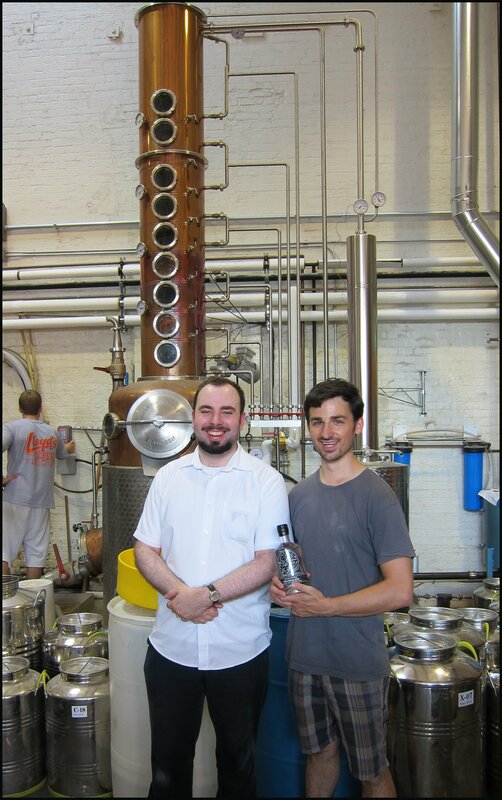 Our trip also saw us visit two distilleries, the first of which was New York Distilling in Greenpoint, Brooklyn. They make a regular gin (Dorothy Parker) and a Navy Strength Gin (Perry’s Tot). Their Shanty Bar was the location of our Navy Strength Gin tasting, where we tasted five gins, all bottled at 57%ABV, including the classic Plymouth Navy and the excellent new offering from Hayman’s, Royal Dock (both of which are available at Graphic Bar). The final two were FEW’s Standard Issue (hitting UK shores soon) and Leopold’s Navy Strength. The second distillery we visited was Breuckelin (the Dutch spelling of Brooklyn), who make a regular gin, an aged gin, and two whiskies (Rye and Wheat). In addition to a tour with distiller, Brad, we also conducted a tasting of nine Yellow Gins in a continuation of the project that we started back in London at Graphic Bar. The weekend saw the culmination of 6 months of preparation: The United States of Gin Tasting, a taster of which was experienced at Graphic on World Gin Day 2012. 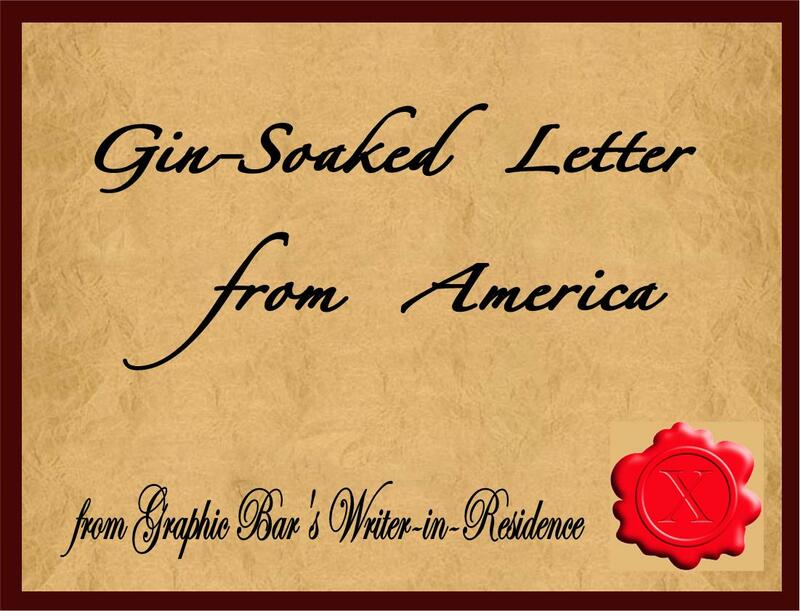 The concept was a simple one: try one gin distilled in each state of the US. Not every state has a distillery that makes a gin, but we aimed to get 30 and that was exactly what we got. The tasting was organised by the author of America’s Gin Website, The Gin Is In, and myself, and some of the highlights included Southern Gin from Georgia, Bardeney from Idaho, and, my personal favourite, BIG GIN from Washington State. We had a rather pleasant flight home with British Airways and I had a rather lovely gin and tonic with Gordon’s at 40%ABV (much better than the 37.5 stuff). The Juniper Society is open to everyone from Gin-connoisseurs to to folks interested in trying Gin for the first time. It provides an opportunity to learn about a bit more about the featured Gin Brand and of course a chance to taste it. 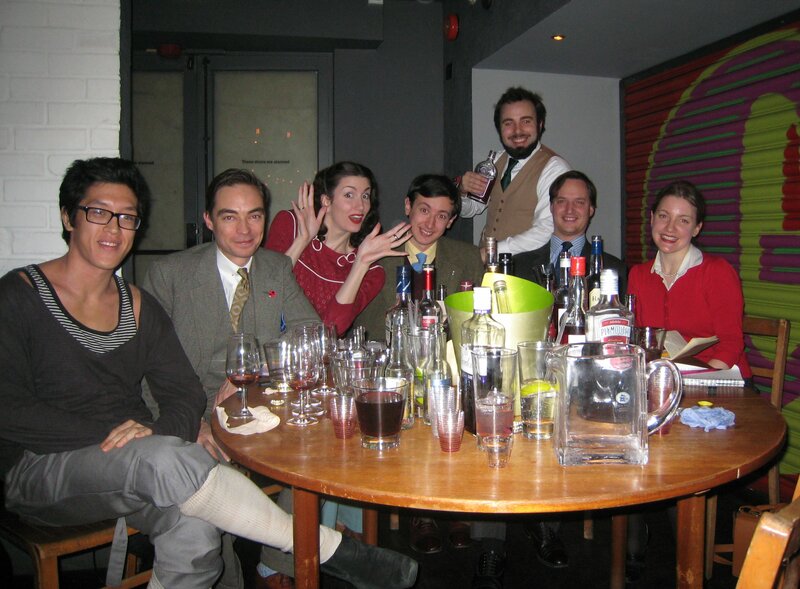 The Juniper Society is a free event and includes a complimentary drink on arrival. Graphic Bar has a selection of over 100 Gins and they feature a different “Guest Gin” each week, with this spirit available in a Gin & Tonic at a bargainous £3.50. An finally congratulation to The Duke and Duchess of Cambridge (William & Kate) on their marriage today. Nice choice on the Aston Martin too. 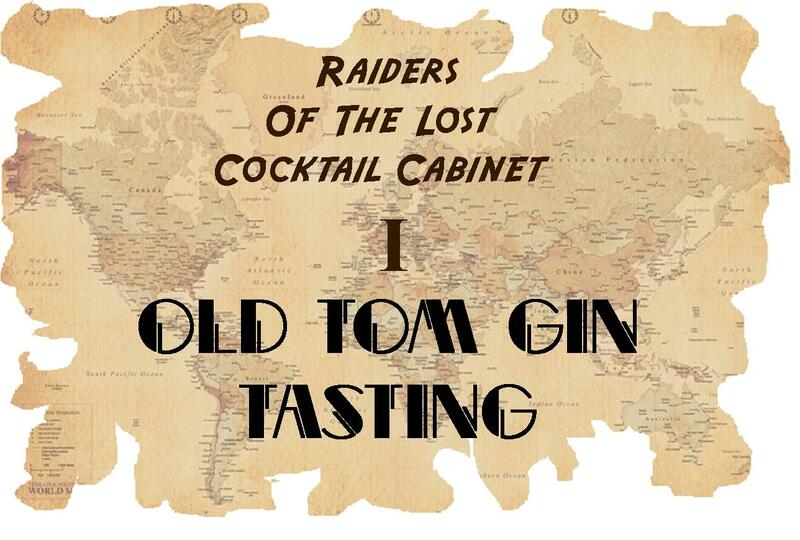 This is the first installment to what I hope will be a continuous series entitled “Raiders of the Lost Cocktail Cabinet”, in which I will look at drinks ingredients that feature in vintage cocktail books (pre-1950), but that have since become defunct or obsolete, meaning that a true recreation of some cocktail was especially difficult.Luckily, over the recent years, there have been a growing number of innovative folks who have set about trying to recreate some of these long-lost ingredients, either using inspiration from old recipes or by backwards-engineering remaining artifacts of the products. This week we shall look at Old Tom Gin. 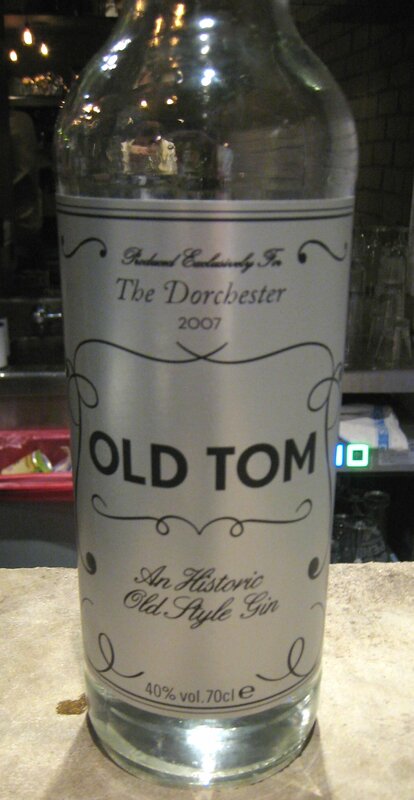 I remember, when I first became enthusiastic about gin, I heard about Old Tom, but never tried it. The first one I ever tried was Boords (when I was in the excellent Bramble Bar in Edinburgh) and I recall being disappointed, thinking that it just tasted like normal gin. 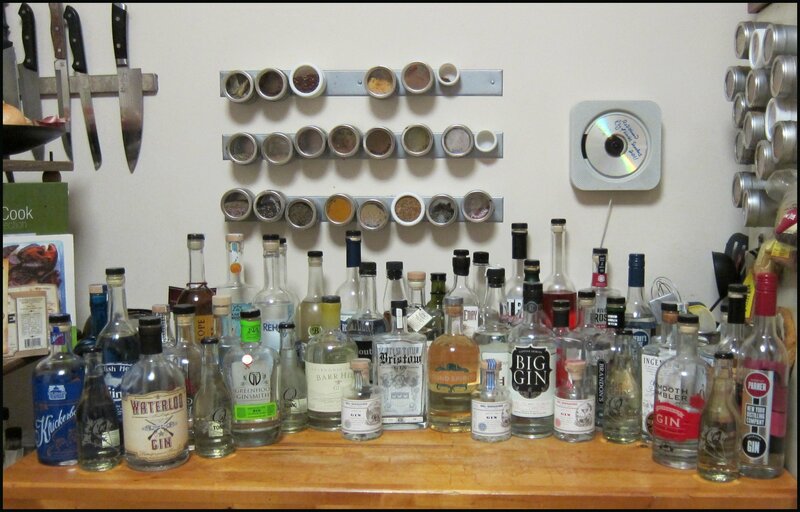 * Since then, things have changed a lot and there are many more Old Tom Gins on the market. There is a lot of discussion about what Old Tom Gin was like and why it came about; one theory is that it was a sweetened gin and that this was partly done to disguise the taste of the gin (that was less-refined when compared to today’s standards). The fact that a lot of gin would have been stored in barrels for shipping and sale also would have meant that the wood would also have added some flavour. It would be easy to write several articles on the origins and history of Old Tom, but as I don’t really think I have anything to add to the already excellent works out there, I shall merely say that Old Tom Gin originated during the 18th century and was available until the 1960s; it’s quite possible that Gordon’s was one of the last producers. The focus of this article is taste. 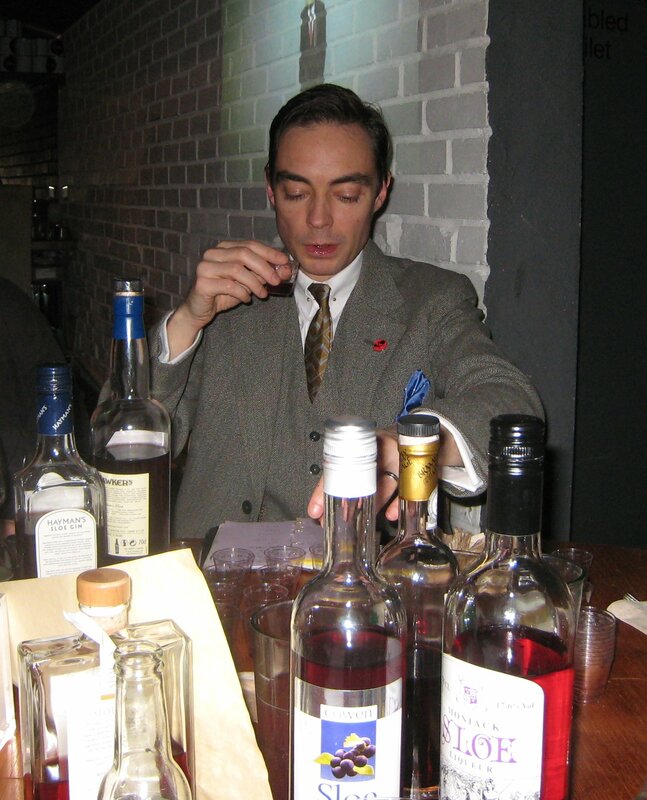 With the help of Kamil of the Graphic Bar and my friend & colleague, Mr. Clayton Hartley, we gathered 10 varieties of Old Tom Gin for us to taste. Also on our panel were: the illustrious Mrs B, Mr Adam Smithson and Master Distiller of Beefeater, Mr. Desmond Payne. 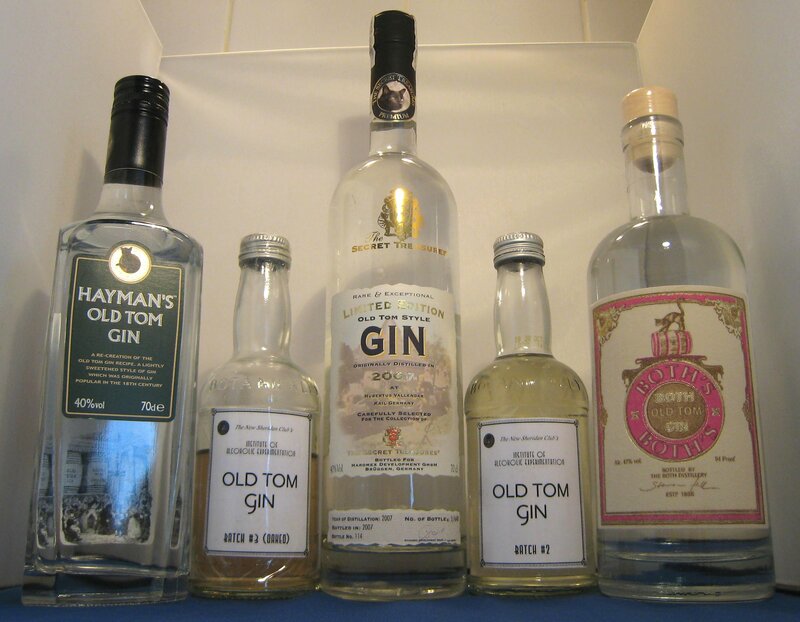 L-R:Haymans Old Tom, Home-made BAtch#2, Secret Treasures 2007 Old Tom Gin, Home-made Batch #3, Boths Old Tom Gin. The Old Tom Gins were all tasted neat and at room temperature. A gin from Menorca with geographic protection and can only be made in the Port of Mahon on the island. Nose: A fair amount of juniper, with strong floral notes, including grapeflower. Reminded some of the panel of pines and a forest. Taste: This had a very complex start: the flavours were intense and then diminished over time in a diminuendo of flavour. Soft and silky, rich in juniper and very floral; not too sweet and had a faint, and not unpleasant, hint of soap. Well-liked by the panel. It was suggested that this was one of the closest to Old Tom Gin and that, with a little extra sweetness and a touch more oakiness, it would be almost spot-on. With this in mind, I exposed a small batch of Xoriguer to half a dozen oak chips for 8 hours and added a touch of sugar syrup. The resultant light-golden coloured liquid emphasises the floral notes of the gin and a touch of vanilla was added from the oak, along with a smidgen more sweetness on the palette. Maybe this is pretty close? Who knows? Both’s Old Tom Gin is made by The Both’s Distillery (founded 1886) for Haromex of Germany and bottled at 47%ABV it was the strongest proof we tried. It was designed to reflect the Old Tom Gin of the 19th century for use in cocktails such as the Martinez. 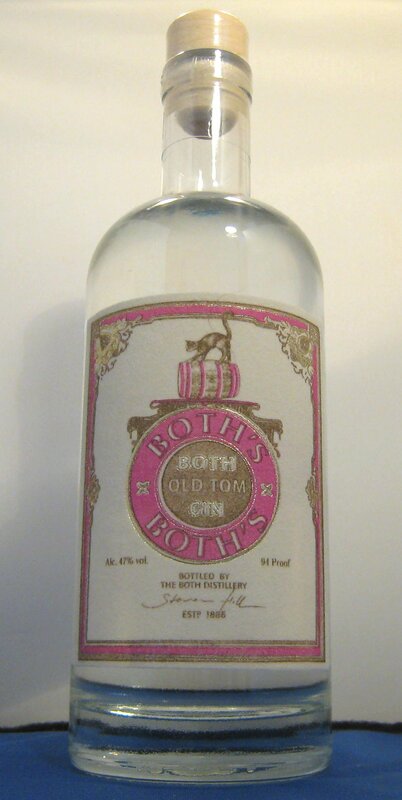 The label, reminiscent of fuzzy 70s wallpaper in texture, looks to have been inspired by the label of Booth’s Old Tom Gin (discontinued), this gives the packaging a nice historical edge. I really liked this as did most of the panel although most felt it improved slightly when cut with a little water as at 47% it was a touch over-powering, even so, very good indeed. Firstly batch #1 was a small test batch and so there wasn’t enough for this tasting. This is based on a recipe by David Wondrich which uses a blend of gin, whisky and sugar. I decided to use the roughest gin I could find (ironically this is made by the same distillery that make my all-time favourite gin) with reference to theory of the sugar being there to make the spirit more palatable. Nose: Fruity, sweet a bit like fruit chewing gum. Taste: A bit to sweet for most peoples palettes, but this is something that can be rectified. some berry elements and a final flavour of Barley Sugar. Made by Ransom Spirits of Oregon, USA. 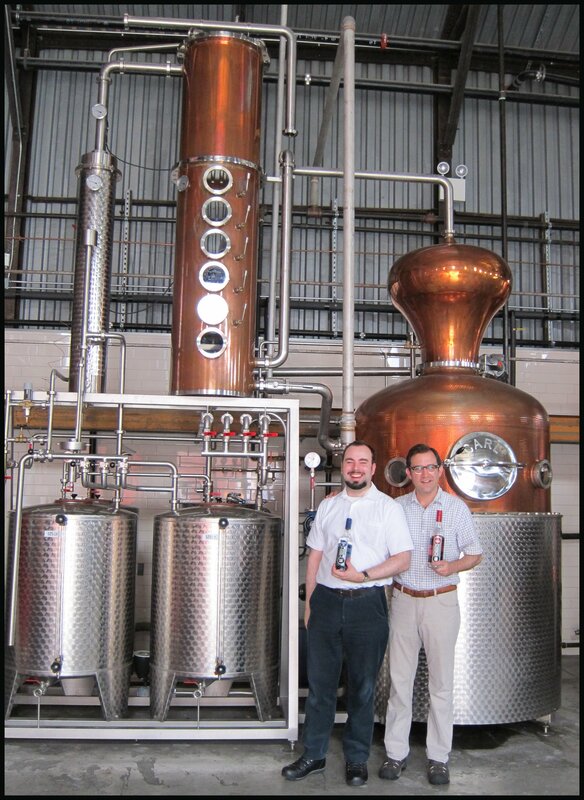 It is described as an historic recreation of the type of Gin that was in fashion during the mid 1800s in America. 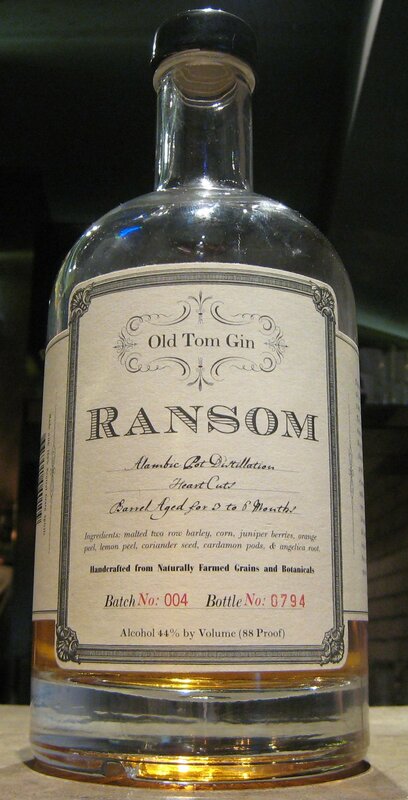 The recipe for Ransom Old Tom Gin was developed in collaboration with David Wondrich. Nose: Very strong nose, juniper and herbs a bit like the 1812 Gin Liqueur or Ginger Wine.. Taste: This didn’t taste like any of the others we tried, it was very bitter and although not to my taste it was liked by quite of few of the panel members, including my wife. There were some hints of dried fruits, such as Papaya as well as some complex herbal notes. Even though this is not like the other Old Toms we liked it was antique cocktails and it could make a pronounced difference in cocktails, it’s not going to be to every-one’s taste but those that do like it will love it. Ransom retails for around $36 for a bottle but is not currently available in the UK. This is specifically described as an “Old Tom Style” Gin and is part of Haromex‘s Secret Treasures Collection, Germany and was created by created by Master Blender, Hubertus Vallendar in Kail. The bottle we tried was one of 688 produced in 2007. It uses a double distillation process and the Juniper come from the Apennines. Nose: soft with some juniper and floral notes, sweet elements too. Taste: a very fresh beginning like cucumber, in particular cucumber skin. A hint of sweetness but the gin remains quite dry, some pine and a little oakiness at the end. If you tend to find many Old Toms a bit too sweet, this is worth a try. Made in the same way as Batch#2 but this was put in a jam jar with a few whisky barrel chippings for 24 hours. Nose: liquorice ice-cream, caramel and onion skin. Taste: Much better than Batch#2 the oak has mellowed out the rough edges of the gin. This was pleasant enough with hint of vanilla and caramel but sadly not much juniper. On the upside it was smooth and easy enough to drink but on the downside it was not very gin-like and it was a bit sweet. I think recipe is a pretty good representation and can give some really good results, but like any recipe the end product is only as good as it’s ingredients also I think I made it too sweet. From the creator of the Bermondsey Gin, this Old Tom is based on an original recipe dating back to the 1840s. Jensen’s take the view that Old Tom was sweeter, in order to hide impurities in the gin, but they suggest that this sweetness came from a more intense botanical mix rather than adding sugar (the cost of sugar being prohibitively high). Nose: juniper and heavy spice on the nose, one panellist said it reminded them of a glue stick, but not in a negative way. Complex with quite a bit of depth. Taste: Not very sweet and a lot of the elements of the nose come out in the taste, pine and strong herbal elements, there finish is reminiscent of liquorice powder and this is where any sweetness comes from. Definitely distinctive from the other we tried, it rather split the opinion of the group. This is made exclusively for The Dorchester Hotel, London by William Grants, the folks behind Hendrick’s Gin. I gather it was created to enable the barmen to authentically recreate some of the truly classic cocktails. I don’t how many runs there have been but I have only ever seen the 2007 bottling. Nose: delicate and fragrant. Hints of rose and sandalwood, undoubtedly perfume-like. Taste: sweet but not without dryness, the gin also had some floral notes. It was silky and smooth with hints of lavender and violet, some panel member were reminded of coniferous forests but all agreed it was very good, well balanced with a real depth of character. The Dorchester Old Tom Gin is available for around £70 for 70cl from The Dorchester Hotel shop. This was one the first of the new recreations of Old Tom Gin it is lightly sweetened and botanically intensive and is based on an historic recipe from James Borough the ancestor of current Master Distiller of Haymans, Christopher Hayman. Nose: good solid juniper nose, a little sweet citrus, like Orange cremes. Taste: very clearly gin, with slightly more intense flavour and an added sweetness. A very neat product and quite easy to drink. IF you see Old Tom as sweetened gin with a little more bang from the botanicals this would be a good choice. Very good indeed. This is a blend of two mystery gins and some nuts and is then aged in a barrel. Nose: Very interesting, notes of tea, toffee, dark chocolate and fresh Bran flakes. Taste: Very complex with a bitter-sweet start. Dryness to start and then some sweet nuttiness such as hazelnut and just a hint of walnut. A rather tannin like finish, such as you might get from a tea liqueur. A complex and flavourful variety that was a treat to try. All the panel enjoyed the taste of this variety but one downside was that it wasn’t especially characteristic of gin. It seems that the Old Toms fell, generally, into two categories: those that were more botanically intense and also sweet (Hayman’s, Dorchester, Both’s and The Home-mades), and those that were just more botanically intense (Jensen, Ransom, Secret Treasures). It also seems that it was the former category that was more popular with the panel. However both The Dorchester and Both’s Old Tom are currently very tricky to get hold of in the UK and so as a starter Old Tom to try out a few vintage cocktails with I would suggest giving Hayman’s a try, also being around the £20 mark it’s not too expensive to experiment with. In conclusion, for a little while I have suspected that there may not be one single description of an “Old Tom Gin” and that at different times and in different places it meant something different. Looking at the variety of characteristics of the brands we have tried and the authenticity of the methods used to create them, I think this surely must be the case. Xoriguer was a really interesting find and I think that using it as an Old Tom (particularly if it has been slightly sugared and oaked) has a lot of potential and deserves further research. *Following a conversation with the Production Manager at Boord’s plant in the USA, it turns out that my view was vindicated, as Boord’s Old Tom is just a normal compound gin, perfectly respectable in it’s own right, but not designed, marketed or considered (in the slightest) as a gin in the Old Tom Style; Old Tom is just their name. This is a similar situation to Wray & Nephew’s Old Tom gin. James Hayman for providing us with a sample and the excellent picture of Gordon’s Old Tom, Chris Seale of Speciality drinks, Blue Island Ltd., Harald of Haromex, Kamil and the folks at Graphic bar, Mr. Clayton Hartley, Desmond Payne of Beefeater and of course, the lovely Mrs. B. Made by Sound Spirits of Seattle, Washington which holds the moniker of being Seattle’s first distillery since prohibition. Their old tom gin is rested on oak chips for about a month; it uses less juniper and more spice than the distillery’s Ebb and Flow dry gin. Taste: A good spiciness up front, nutmeg, cinnamon and ginger followed by some citrus and juniper, then coriander and finally some dry floral notes on a long finish. Made in Loveland, Colorado this old tom gin contains a mix of 7 botanicals: juniper, coriander seed, orris root, lemongrass, rosemary, galangal root and pink grapefruit peel. The gin is aged in new, toasted, not charred, American oak barrels for 6 months to add a little warmth. Nose: Very strong juniper – pine, but with an intriguing vegetal note alongside it and a sweetness, too, like celery with hints of sweet licorice powder. Taste: The same vegetal notes from the nose come through on the taste, with a combination of savory, sour and bitter notes, including celery. The finish is slightly sweet, like licorice sticks, with more straightforward notes of piney juniper at the very end. 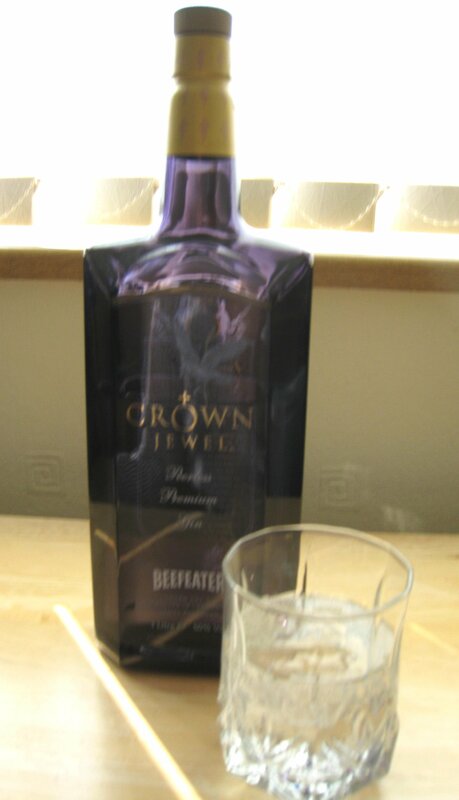 Made by Downslope Distillers near Denver, Colorado it is designed as an interpretation of a late 1800s style gin. It contains a mix of seven botanicals and is aged in wood for a number of months. Nose: Some dry cider apple notes and then some bready maltiness. Taste: A good full texture, some ripe apple to start followed by some sweet herbal notes, cinnamon and nutmeg. Reminiscent of a spiced baked apple. This is followed by a little maltiness and then some dry citrus, juniper and a hint of chocolate. A very complex example of Ould Tom Gin, as sippable as a malt whisky. Dating from 1936 and made in Norway by Arcus, Goldencock is the only old tom gin that still exists from the time before most brands stopped producing it. Given that it is not exported from Norway, it remained largely unknown for decades, with only scant reference in some books. Taste: Strong and intense flavor with herbal notes up-front, rosemary thyme and a hint of mint followed by some juniper pine. This is followed by a little sweet spice, lots of licorice and then a dry citrus finish. Made at the Langley distillery in the oldest gin still in the UK, with a recipe dating from 1783. The gin contains a mix of 11 botanicals (juniper, coriander, angelica, lemon, orange, orris, cardamom, cassia, licorice, cinnamon, and nutmeg) and 4 grams of sugar per liter. The gin is unusually packaged in reused champagne bottles with a silkscreen print. Nose: Vibrant, sweet lemon and vanilla, like lemon cheesecake, with a little soapy coriander, before returning to a fresher, lemon note. Taste: Very smooth, with a hint of sweetness to start that is quickly outshone by strong notes of juniper, lemongrass, and coriander. The finish is of soapy coriander, juniper, and a dry note like wood crossed with soda water. Yesterday, Mrs. B and I had the fortune to attend the Plymouth Gin Juniper Society and Martini Masterclass; or, as I like to call it, the Plymouth Gin Christmas Extravaganza. For a full round-up of the evening’s festivities, check out the Institute for Alcoholic Experimentation (article coming soon). 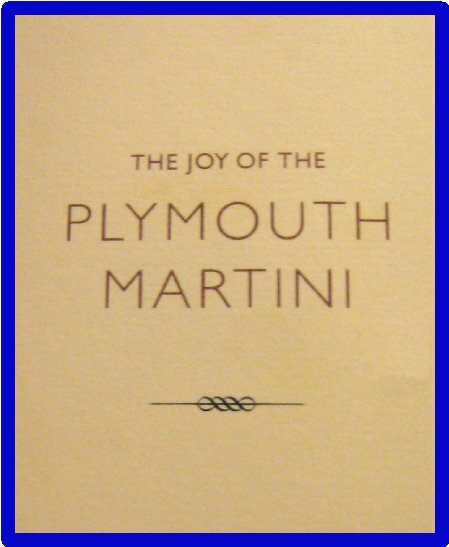 One of the gifts in our, very generous, goody bag was a book entitled, “The Joy of the Plymouth Martini”, and this shall be the basis of this post. 1) Double strain; using a cocktails strainer and then a tea strainer, this removes the tiny shards of ice that can leave a drink watery. 2) Be Ready! Don’t allow your ingredients to sit in the ice for long before mixing, once again this leads to a more watery drink. 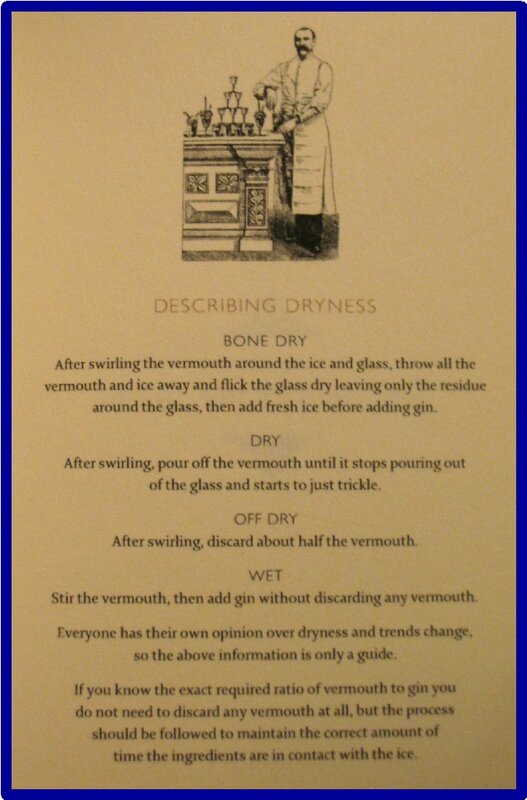 Given my curiosity concerning things like Martini Stones, I found this classification system of interest and discovered that, although I hadn’t heard of the term before, it appears that I like my Martinis “off-dry”. (Noilly Prat being my current Vermouth of choice). Fruity Martinis can be controversial, but I agree with the many great bartenders before me that, if it tastes good and you like it, drink it. Either way, I didn’t see many people turning away their Fruit Martini welcome drink! My watermelon one was delicious. Add fruit and sugar to shaker and muddle; add water and Plymouth Gin and ice. Shake 15-20 secs, taste and sweeten if necessary. Now you can make any kind of Fruit Martini you like, maybe even a Medlar Martini. Should you be stuck with a lack of ideas, Plymouth do make some suggestions. On the other hand, if you fancy returning to a classic, there is also a very comprehensive, yet concise, history of the classic Dry Martini or the Marquerite. 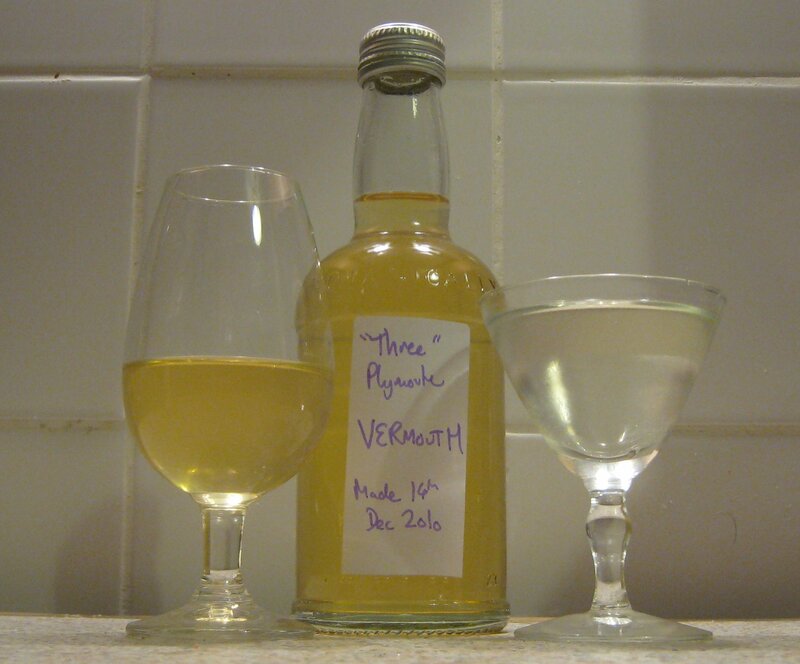 Now for the really interesting stuff: the folks at Plymouth also provide you with a recipe for a custom vermouth & bitters, both of which are specifically designed to complement Plymouth Gin. I was distracted whilst writing this post by a sudden urge to make Vermouth to this recipe. 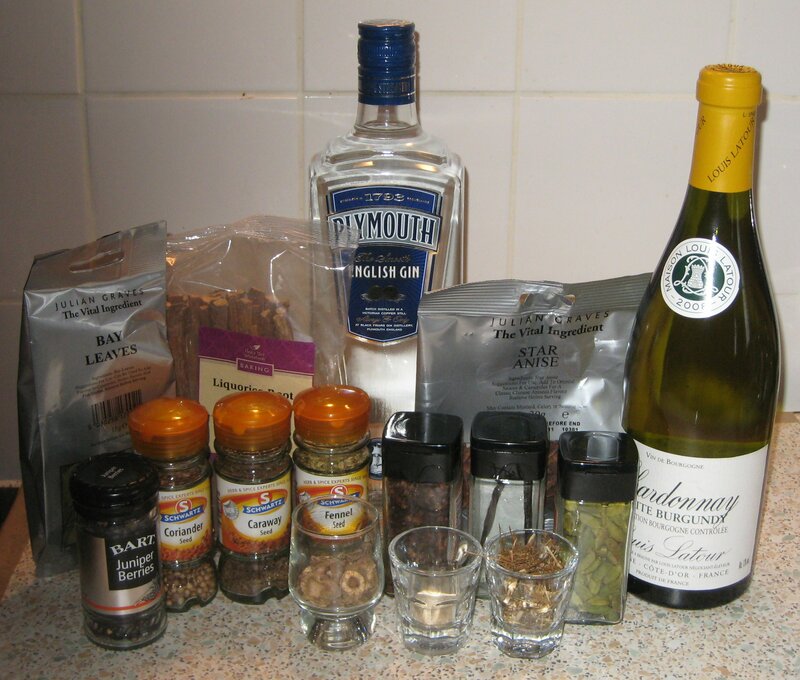 Having only cloves and Plymouth Gin in the house, I was soon heading into town to find the rest of the ingredients and was surprised when I managed to return some time later with all of them. This was quite fun to make and took about an hour, muddling the ingredients together first certainly help the flavour to come out. When tasting, the nose is very much if the wine base but also the angelica and star anise come out too. The initial flavour is quite sweet and then more herbally, some wormwood, fennel and anis are noticeable. It is also quite soft as vermouths go. The vermouth, in a glass, in a bottle and mixed in a martini. Why "Three"? Well, it was formualtion #3 of the dozen they tried that the Plymouth team liked best. The book concludes as any good cocktail book should with space for you to write-in your own ingredients. This is a great little booklet, one of the best I have seen created by a specific brand, get hold of one if you can. For more Barroom Bookshelf Reviews click here. A few weeks ago, a friend and colleague of mine said, “I’d quite like to do a sloe gin tasting”. Needless to say, I agreed that it was a superb idea and we immediately set about procuring various samples for the evening. Originally I thought we’d get about 8, then 12 looked for likely but, in the end, we tried 17. L-R: Will, Hartley, Fleur, CB, DBS, Robert, Mrs. B. We initially tried the sloe gins on their own at room temperature and then tried them mixed with Fevertree Lemon Tonic/Bitter Lemon and Fevertree Lemonade in Long Pedlers. Here follows a summary of our panel’s notes on each. Produced by Highland Wineries, near Inverness, this has the lowest alcoholic strength of all those that we tasted. Moniack Castle also make a selection of other liqueurs, country wines and preserves. Nose: Cider, Rosé wine or Rose Cider (something like Jacques Cider). Taste: Sweet, somewhat reminiscent of a White Zinfandel, with hints of rose petals and strawberries. This was rather refreshing, smooth and quite unusual, as sloe gins go, but it was agreed that it was still quite a nice drink. Moniack Castle Sloe gin Liqueur is available for around £13 for 75cl from DrinkOn. This was the first of three sloe gins that we tried from Bramley & Gage, who are well-known for their range of liqueurs, as well as their new gin and its companion tonic: 6 o’Clock. Both Bramley’s original and sweet sloe gins use a mixture of wild Dartmoor and imported sloes, steeped in gin that Bramley make themselves. This product contain a liberal amount of sugar and was designed for people that found the original too tart. Nose: Liquorice, almonds, cherry and marzipan. Taste: This was very sweet; too sweet, for some (it’s worth noting that these differences are why Bramley introduced the product in the first place). It has a little acidity at end and some herbal notes. We found that this mixed really well and was well liked by the panel. Bramley & Gage’s Sweet Sloe Gin is available form their website for around £14 (35cl). 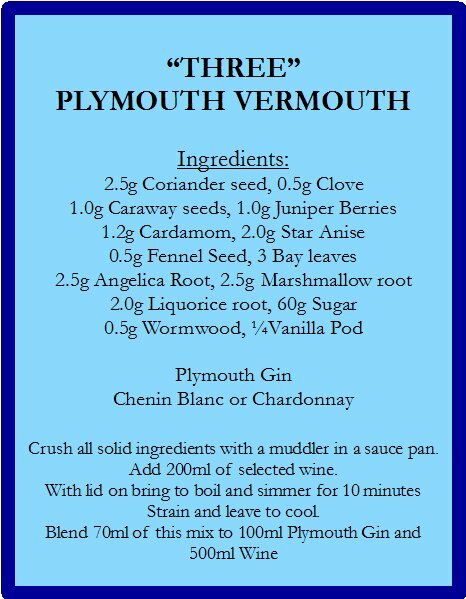 Made using the famous Plymouth Gin and Polish sloes, this contains noticeably less sugar than its counterparts in the tasting. I really like this; it had a great jamminess in the mouth, which the panel enjoyed, but still had a tart finish. It was found to taste less artificial than some of the others and, with the fruitiness and a little spice, there were a lot of people who thought this “smelt like Christmas”. In addition to this festive fragrance, it smells like sloe and it tastes like sloe. It was agreed that this was a first-class example of sloe gin and something of a benchmark for the others. Along with Juniper Green this was the Most Sippable Sloe Gin. Plymouth Sloe Gin is available for around £18 (70cl) from The Whisky Exchange and from their excellent distillery shop in Plymouth. (One of the few places in the country where you can still buy their splendid Fruit Cup). This is the most recent release (it’s been around for about a month) from Sipsmith Distillery, who were recently voted “Best Newcomer” at the recent Observer Food Monthly Awards. It uses Sipsmith Gin as its base. Nose: Juniper nose mixed with sloes, memories of home-made sloe gin. Taste: This was found to be the closest to the “home-made” varieties people had tried; “just like mamma used to make”. This had a jamminess, similar to Plymouth, and the underlying Gin element was more dominant the the others. The one downside was a little sharpness at the end. 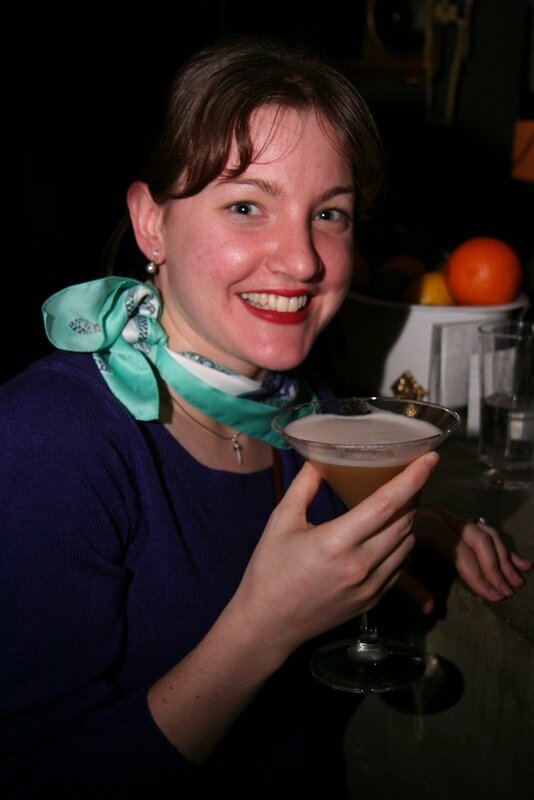 Nonetheless, it was considered a great winter warmer and probably had the most potential to work well in cocktails. The handsomely packaged Sipsmith sloe Gin is vaialable for around £17 (50cl) from The Whisky Exchange. With our selection of Sloe Gin in the foreground Mrs. B & I enjoy a Gin & Tonic, “Evans” style. This is a version of #2; similar, with a lower sugar content. Bramley also make a drink called Slider, which is usually made by removing the sloes from the sloe gin after maceration and combining them with cider. I used the same technique with some mincemeat vodka I made recently, making a mincemeat cider which was very tasty. Nose: This had a similar nose to the sweet, as you may well expect. Taste: Fruit & almond flavours, reminiscent of cherry bakewells. This was certainly tarter than the sweet variety and I found it more to my palette. It felt very warming and was, all in all, quite popular. Bramley & Gage’s Original Sloe Gin is available form their website for around £14 (35cl). Part of the Reserve Liqueur range of Lyme Bay Winery (other varieties include Elderflower & Lemon and Blueberry) Lyme Bay also make a range of other country wines and liqueurs. Lyme Bay typically use English Sloes they also make a sloe wine and a Sloe wine-based fortified liqueur. I have been to their on-site shop which has good range of tasty products on offer, well worth a visit if you’re in the area. Each bottle is numbered and our was RL22676. Nose: Smells like gin; very strong smell of juniper – a nice change. Taste: This was sweet and smooth, and unusually light for a sloe gin. It was rather lovely and sufficiently quaff-able. All in all, it was popular with the panel, although one member remarked that it as rather Calpol (children’s medicine), but I think was actually a good thing! Lyme Bay Sloe Gin (£11.99 for 35cl) and other products are avaialble from their website and the gift section of John Lewis. The best-selling sloe gin in the UK with the widest distribution, too. If you’ve had commercial sloe gin, it would probably have been this. The modern version uses wild sloes, whereas its predecessor used dry sloes. Nose: Floral and perfumed, with juniper and a bit of spice. Taste: This was one of the few sloe gins in our tasting that people had any preconceptions of, but everyone was pleasantly surprised: everyone quite enjoyed its simple, balanced fruitiness and its intriguing notes of earl grey tea. Gordon’s Sloe Gin is available for around £14 (70cl) from Waitrose, Tesco and other leading supermarkets. This sloe gin has a Royal warrant (the warrant itself is held on behalf of Hawker’s by none other than Desmond Payne, Master Distiller of Beefeater) and is made with Dartmoor sloes. It is bottled at 28%; a little stronger than the usual 26%. Taste: This was unlike anything else that we tasted that night, and it was really popular. It was quite sweet, but the panel still thought that its flavours worked. There were hints of mince pies and some strong herbal, almost menthol, notes. This is more complex than your classic sloe gin and is slightly set apart in terms of style. Although it wasn’t unanimous, this was one of the panel’s favourites. Along with Jack Cain’s this was The Most Unusual Sloe Gin – i.e. the least like the others we had tried. Hawker’s Sloe Gin is available for around £18 (70cl) from The Drinkshop. Speed-tasting with Mr. Hartley using the SCH method. We were sent some samples from October 2010 (ever so fresh then). The sloes for this sloe gin come from Romania, as it is difficult to get certified organic sloes from the UK (ensuring they have been affected by wind-drift from the crop-sprayer or fertiliser run-off from fields is tricky). The sloes are steeped in Juniper Green Gin (40%) and the sloes are left to macerate until the alcohol level of the liquid drops to 26% (as the sloes absorb the alcohol). Nose: Clean nose, with fruit and a little cinnamon-like spice, followed by juniper berries. Taste: A nicely balanced, home-made taste. Warming, with a light sweetness and flavours of apples, pears and cinnamon. The panel really enjoyed this and it was amongst their favourites. Along with Plymouth this was the Most Sippable Sloe Gin. This is made by family firm Hayman’s Gin this uses wild English Sloes and their own Gin as it’s base. 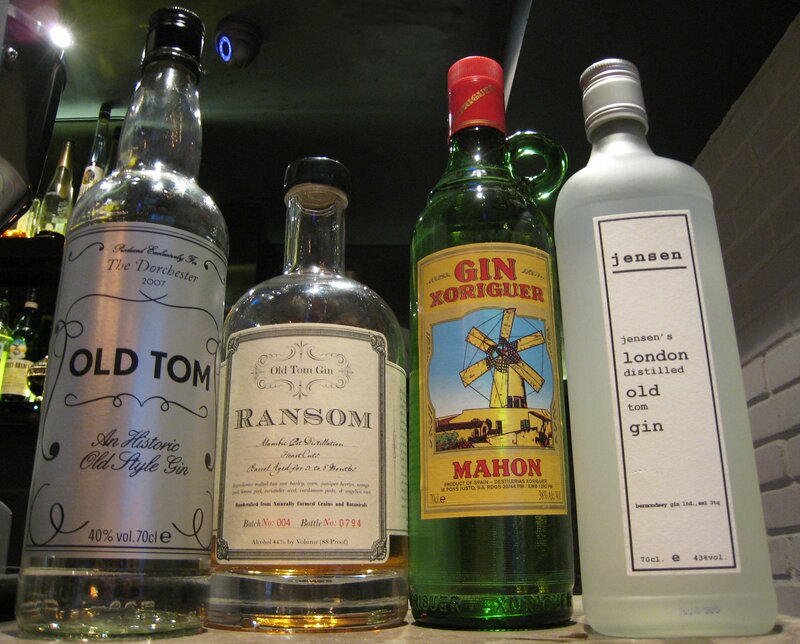 Hayman’s also make a London Dry Gin, an Old Tom Gin and a Gin Liqueur. Nose: lovely heavy sloe nose. Taste: Quite light and refreshing, simple yet satisfying with a little cinnamon and a little citrus on the finish. Sweetness and tartness well balanced. Hayman’s Sloe Gin is available for around £18 from the Whisky Exchange. This variety of Bramley & Gage’s sloe gin has a different spirit base and all of the sloes are imported (once again, the problem of getting certified organic sloes in the UK arises). Nose: Strong smell of almond and marzipan, but with a more subtle scent then the other two. I believe that the almond comes from the stones of the Sloes. Taste: This was a soft, light sloe gin, with an excellent balance of tartness and sweetness. It’s quite fruity, with some folks tasting raisins, and there was a very light saltiness at the tip of the finish. This is a great sloe gin and our clear favourite of the three Bramley & Gage’s. Bramley & Gage’s Organic Sloe Gin is available form their website for around £17 (35cl). Founded in 2002 SLOEMotion now make a variety of Sloe based products: Sloe Vodka, Sloe Whisky, Sloe Brandy and of course Sloe Gin. Their sloes come from local hedgerows and they use the sloes from the liqueur making process in a range of truffles and chutneys. Nose: Smells like bitter cherries and a little maraschino. Taste: Juicy and tart, with a nice sweetness, a bit of caramel and a vanilla finish. SLOEMotion Sloe Gin is available from £15.95 (35cl) from their website. I can also strongly recommend their Sloe Whisky. 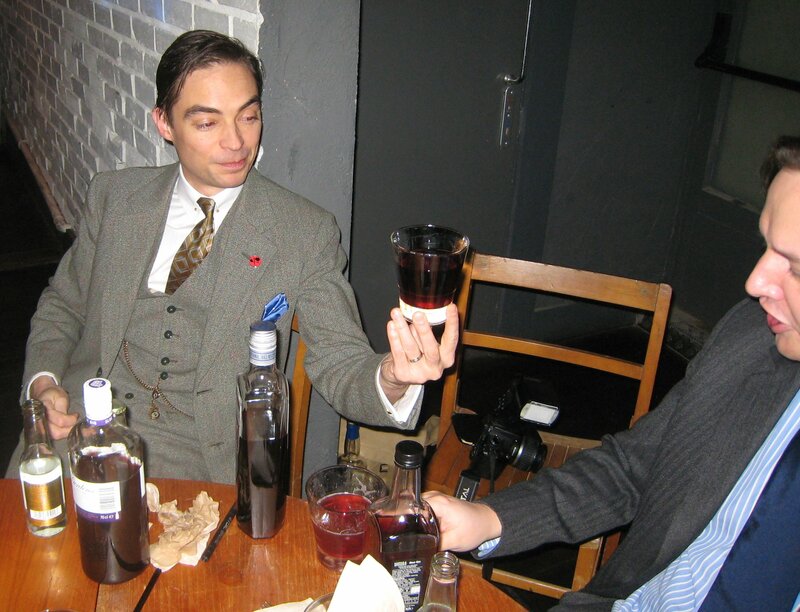 Robert seems reluctant to try Mr. Harltey’s concoction a mix of 17 different sloe gins, a tasting in glass! This hot-footed to us all the way from France and is part of a range of products developed by Gabriel Boudier specifically for bartenders as opposed to a product sold in it’s own right. Nose: Slightly reminiscent of cherry brandy and bitter almonds with a little citrus. Taste: A good sloe gin, being both smooth and balanced with a silky texture. It was very drinkable and described as a “polite” sloe gin: delicate, but tasty and reminding one panel member of a “lovely big pillow”. Gabriel Boudier Sloe Gin is available for around £17 (70cl) from The Drinkshop. Marks & Spencers have a good range of own brand wine & spirits in addition to the sloe gin they make a Pink Gin and a Gin Fizz. Their sloe gin in made in France and contains: juniper, coriander, lemon & orange peel, angelica, orris root and fennel seeds. The bottle recommends serving it on-the-rocks or with tonic. Nose: Sweet, with hints of almond and marzipan, a little cherry brandy. Taste: A very short flavour, but easy to drink, with a pleasant smoothness. Although this sloe gin had no really remarkable qualities, we all agreed that this had wide appeal. This was surprisingly similar to number 13. Marks and Spencer Sloe Gin is available for £10.99 (50cl) from larger M&S stores. This is made by Foxdenton Estate, who also produce an excellent 48% gin (review here) as well as a range of other liqueurs. This was paler than most sloe gins, and was bottled at slightly stronger 29%. Nose: Strong gin spirit, followed by a little sweetness and then the fruitiness of the sloe. Taste: This was the least thick & sticky of our sloe gins. Initially, you can really taste the underlying gin, foillowed by the sweetness and the sloes. This is neither sweet, nor excessively sharp; it is both different and tasty and, for that reason alone, is really worth trying. Foxdenton Sloe Gin is available for £18.80 (70cl) from their website along with their other liqueurs. Smaller sizes of the Sloe Gin are available. From Malcolm Cowen (Drinks) Ltd., this sloe gin is bottled at 26%. The gin is distilled at Thames Distiller and they use organic sloes. Cowen also make and distribute a variety of other hard-to-find liqueurs. Nose: Sweet cherries, followed by the underlying gin spirit and a hint of dry almonds. Taste: This sloe gin fills the mouth with the flavour of sweet ripe berries and a little lavender. This fades to some dryness and a warming finish. A nice example of sloe gin. Cowen is available for around £16 (50cl) from The Drinkshop. Jack Cain’s Sloe Gin is available from a variety of locations. It is worth noting that to be considered “sloe gin” a spirit must be of a minimum strength of 25%ABV. I imagine that this along with being a sweet spot for taste is why most Sloe Gins are bottled at around this strength. (Thanks to Michael for this update). 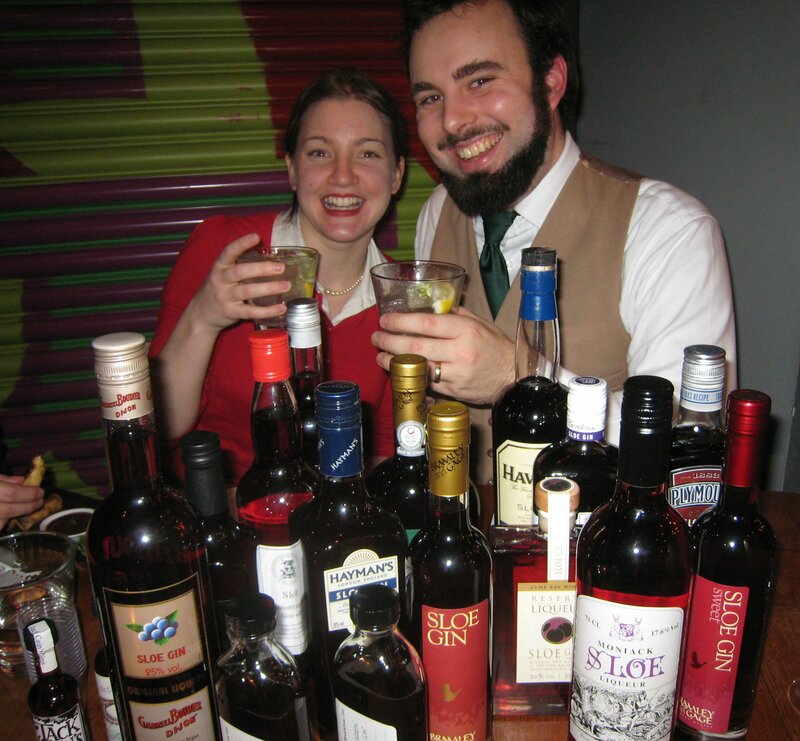 For details on which sloe gins worked well when mixed, please see: The Sloe Peddler. I would like to thank the folks at Graphic Bar for hosting the event, the producers who have been very generous at sending us samples of their Sloe Gins, Fevertree for providing the mixers and of course the panel. 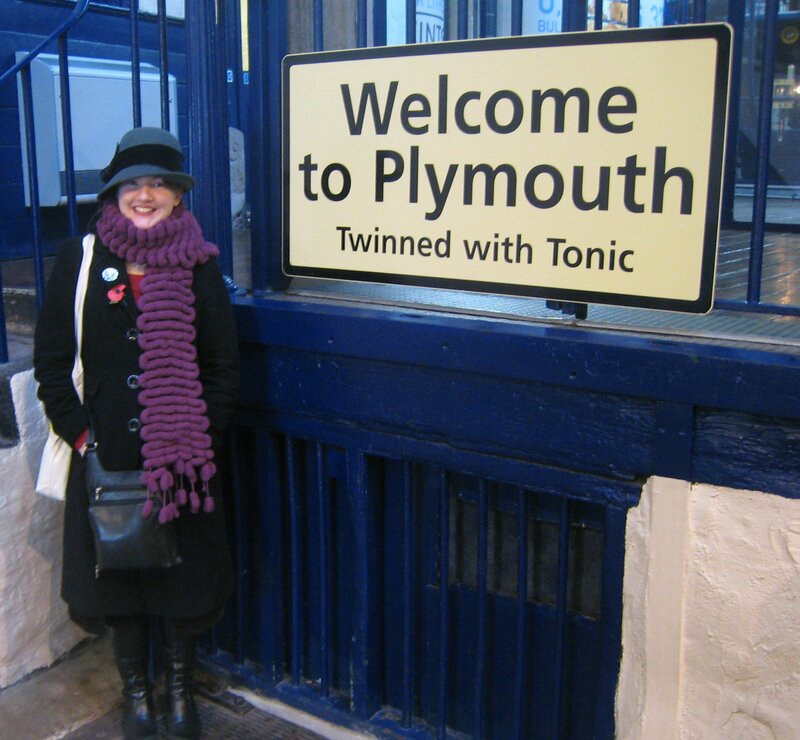 Plymouth twinned with Tonic (a small mountainous village in Peru, famous for it effervescent springs and forests of Fevertrees. As I sit here in the Gog & Magog, a pub a few steps away from the Plymouth Gin Distillery, I would like to tell readers about an event involving the great spirit of this city. Graphic, 4 Golden Square, London, W1F 9HT. Plymouth Gin – The Martini Sessions will take place at the excellent Graphic Bar in London (a modern gin palace with 70+ varieties of Gin on hand) and I’m sure will be great event for the last Juniper Society for the year. 2) A short tasting of Plymouth Gin itself. I’m also looking forward to what I expect to be an informative and entertaining piece on “making cocktails at home”. For further information, and to reserve your place, please see the Juniper Society Website or contact the bar on 0207 287 9241. All are welcome (not just Jolly Gin Fellows) and there is no charge for the Gin Tasting, Martini Masterclass or the welcome cocktail. 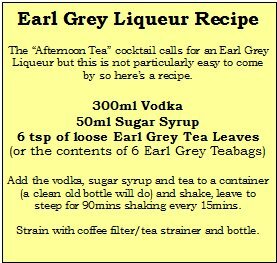 Whilst reading the 1997 edition of Pacult’s Kindred Spirits, I was intrigued by his scathing review of an “oozing” Earl Grey English Liqueur; figuring that such a product was unlikely to be available, I became fascinated with the idea of creating my own. After a little research, I managed to cobble together a recipe from a few different sources and found myself eagerly on a quest for some loose tea leaves. After the relative success of the resultant liqueur, I started to think about possible variations. I finally settled on three: the first was inspired by a discussion on tea that I had had at a Beefeater 24 event with Clayton and Liz, where Lapsang Shoshong was mentioned; Green Tea seemed a natural fit for the second; and thirdly, Mrs. B, with her unique sense of humour, suggested using English Breakfast Tea. With a citrus nose, it started like iced tea. The initial sweetness was replaced by the bitter tannins, which then faded to a tea-like muskiness; afterward, there was a comeback of warm vanilla and a slightly bitter bite that eventually left behind a pleasant warmth. This smelt like soggy cabbage, this tasted like soggy cabbage. To give it its due, this started pleasantly enough, in a sweet fashion, but it turned out to be merely a diversion prior your being hit with a harsh bitterness that remained until the end. The initial false sweetness reminds me of certain herbal liqueurs, such as Suze & Campari. This was a warm shade of ochre and smelt like tea sweetened with honey. It was the sweetest of the bunch and started off with a honey-like sweetness that made way for an understated bitterness. It ended with a warming punch and, although it had the same alcohol content as the others, it certainly tasted stronger. It improved when cut with a little water. I found that this made a palatable cream liqueur when mixed two parts liqueur to one part cream. Until I decided to make a liqueur out of this, I had never tried this tea before. This liqueur smelt like cedar wood and smoked wood chips. Its taste reminded me of Bonfire Night, with flavours of cured meats and Bavarian smoked cheese. Smoky. This had a lovely warmth and was truly unlike anything I have ever had before (so much for modesty), and it didn’t have the bitterness of the others. Definitely my favourite. A second version involved a more complicated manufacturing process and, additionally, contained some gin, as I ran out of vodka. I also combined the tea and sugar before adding any spirits, and some water was added to the final product to balance out the flavour. The result was a slightly thicker, sweeter version, which resembled commercially available liqueurs more closely than the others. I took some along to a recent tonic tasting at Graphic and it seemed to go down well. Double shake, strain and serve. 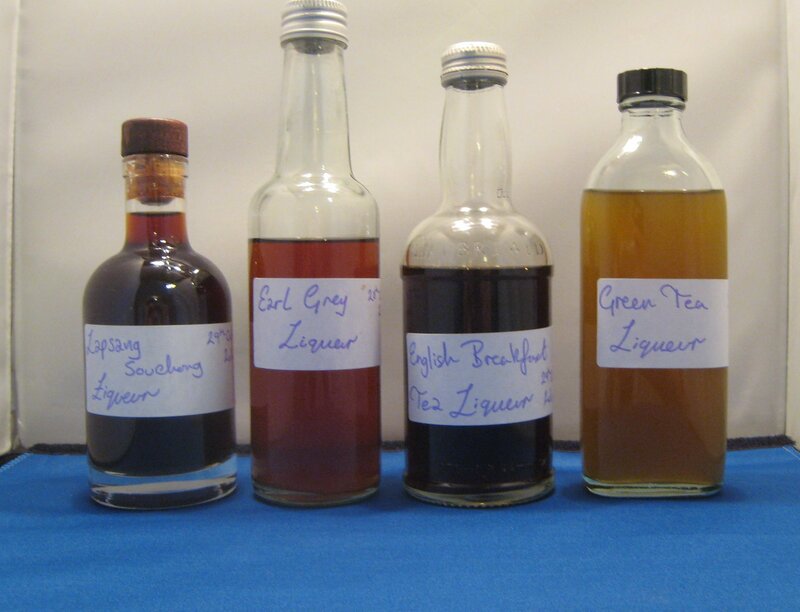 All in all, I’ve immensely enjoyed experimenting with these liqueurs and I have already had requests for more; in particular, more batches of Lapsang Souchong and English Breakfast are in the pipeline. I’ll be sure to keep you posted with updates on any future experiments.